Public policy is a great way to address problems within society. However, policymakers are human beings and human beings are flawed; we do not always get it right. Policymakers come to the table with the best of intentions, in most cases. Good intentions do not always make for good public policy. This is true in the case of education. For years, policymakers have tried to come up with ‘common sense’ policy designed to ensure that all students, regardless of their personal circumstances, learn and achieve in the classroom. Over a decade ago, lawmakers at the federal level decided that the federal government needed more oversight and control to ensure that all students would receive a fair and equitable education. The No Child Left Behind Act (NCLB) was born. No Child Left Behind did many things. For one, it provided more aid to disadvantaged students. But what NCLB also did was increase the federal government’s role in education. It demanded that states design and implement annual and regularly scheduled assessments in the form of standardized test and attach those scores to teacher performance in exchange for more federal dollars. The overall premise of NCLB was that the creation of high standards and goals that could be measured would achieve strong educational outcomes for all students. However, NCLB was wildly unpopular. According to a 2012 Gallop poll, 67 percent of adults polled nationally said that NCLB either had not made much difference in education or made things worse in education. One major reason NCLB was unpopular is that it punished ‘bad’ schools and rewarded already well performing schools. The good schools got better and the bad schools got worse. One of the deciding factors to determine whether a school was good or bad was their assigned proficiency benchmark(s). NCLB mandated that all children throughout the nation would meet the proficiency markers assigned to the schools they attended. Affluent schools, that are traditionally White, often did well under this model, while high poverty schools, that are traditionally Black and Latino, often failed under this model. Citing the error of their ways, federal lawmakers have heard the pleas of the people and the demand of states to obtain the autonomy they lost under NCLB. They have decided to pass a new law to write the wrongs of NCLB. This new bill is called the Every Child Achieves Act (ECA). ECA has much of the same lofty goals of NCLB but it has some differences in strategy. ECA gives states more autonomy to develop accountability systems for achievement and teacher performance. ECA also ties federal monies to the recommendations of states according to their accountability systems. ECA ends federal mandates on teacher evaluations. Lastly, ECA eliminates the adequate yearly progress system and the sanction attachment to close schools. ECA was recently passed in the Senate. The House passed its own version of ECA and now members of each chamber will meet in committee to hammer out a final version of the bill to put before the president for his signature. Only time will tell if this new policy is destined for greatness. However, one cannot be blamed if they chose to look at this new bill with a cynical eye. On its face, ECA looked and sounded very good, just as NCLB did. When comparing the two, one is lead to a philosophical crossroads of sorts. You can rein in more control over the entire education apparatus, but hinder the impact of people on the ground that are familiar with the needs of their constituencies. You could delegate and offer more autonomy throughout the nation, yet compromise the uniformity of standards making one unsure of who is learning and what they are learning. Good intentions can be a catalyst to finding a compromise to this crossroad. However, the road to hell is paved with good intentions. It looks like we are too far down the road for a U-turn to make a difference. 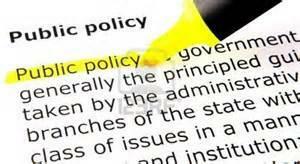 I spent 38 years in the public sector and never saw a “policy” in an intellectual sense. I did see thousands of products forged by elected officials at all levels of government in response to the demands made by competing interests in the political arena. I always thought, and still think, that elected officials should be honored for this work, not found fault with. For better or for worse, policy purposefulness is absent from the political process: we make it up when we seek to explain what has been done. POlicy if often created and then revised. We learn what we don’t know and then change; but there are powerful politcal players who work to change policy to their liking.